Mayor Krewson on October 4, 2017 taking part in thanking and recognizing the South Grand Community Improvement District, South Grand business owners, including its many emigrant-owned businesses, the International Institute of St. Louis, and neighborhood residents for creating a distinctive and vibrant community. Photo courtesy Robert Myers. The American Planning Association, an international organization dedicated to creating vital communities through excellence in community planning, is pleased to announce that South Grand Boulevard has been selected as one of fifteen Great Places in America in 2017. 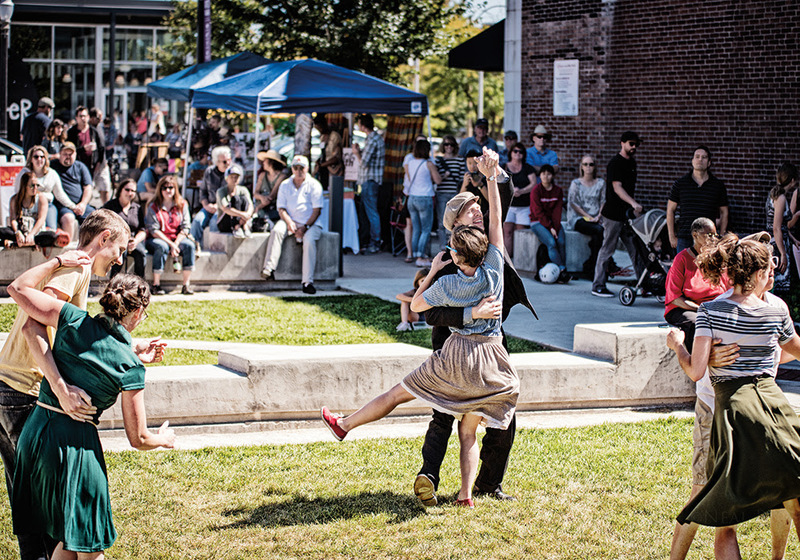 South Grand is one of five communities nationally winning within the Great Streets category. On Wednesday, October 4, representatives from the American Planning Association (APA), the City of Saint Louis, the South Grand Community Improvement District, the South Grand business community, and the APA-St. Louis Metropolitan Section gathered outdoors at Rooster to announce the award. Before the corridor’s renovations in 2015, South Grand Boulevard traffic averaged speeds of 42 miles an hour. Accidents averaged 80 per year. Recognizing the threat this throughway posed to the neighborhood, residents of the South Grand Community Improvement District lobbied for the adoption of their “South Grand Boulevard: Great Streets Initiative” in 2011. The City of St. Louis has now reduced South Grand Boulevard’s traffic lanes from four to two and implemented additional traffic calming improvements to reduce speeds and promote pedestrian safety. Two alleyways were closed to cars and rededicated to people walking and biking. Traffic speeds were reduced, lanes were dedicated to buses and trollies, and crosswalk lights were lengthened. The rate of accidents has been greatly reduced while commercial activity has soared. Now, go visit the street to celebrate!